hen we launched in December 2013, I wanted to give an online voice to Coastal Virginia -- a voice that said, "Hey! Yes, Charlottesville and northern Virginia weddings are amazing, but so are Coastal Virginia's!" Since I was a wedding photographer at the time, it was a huge passion stemming from a need to communicate with Hampton Roads and out-of-town couples what was available locally. As things evolved over the years, we have gotten quite a few repeated requests for the Tidewater and Tulle brand, but before we get into that, I wanted to share some important milestones. 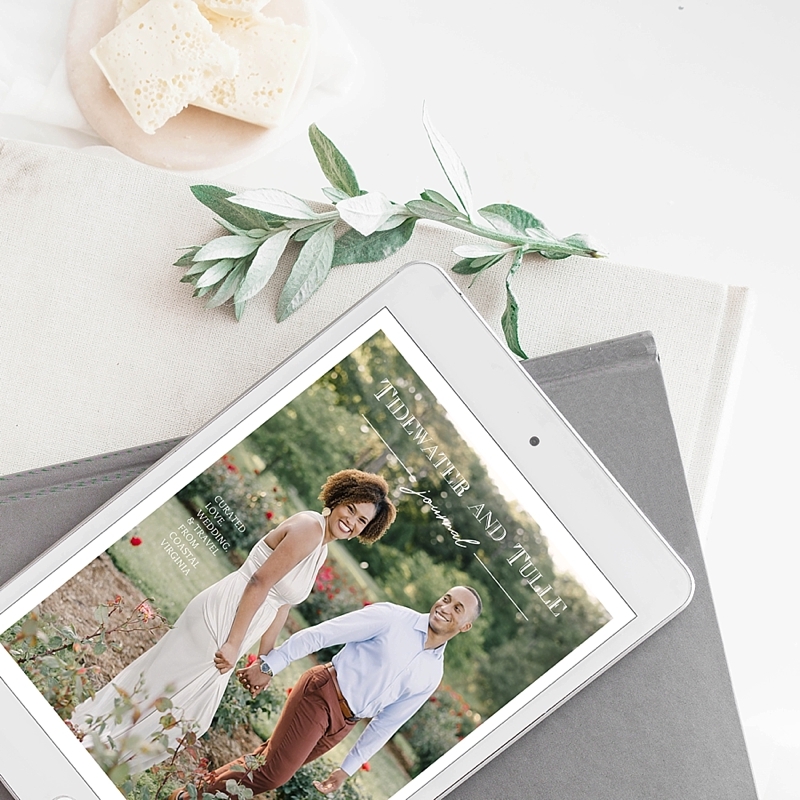 • Announced Tidewater and Tulle's upcoming website launch and started #hrvaweddings in July 2013 to unite a local wedding community's Instagram content which has now amassed to over 10K photos from vendors, couples, and other wedding lovers. • Reached 10K monthly unique visits in June 2014. • Achieved being in the Top 75 Professional Wedding Blogs worldwide in mid-2014. • Were invited to be part of Style Me Pretty's contributor network in September 2014. • Represented Tidewater and Tulle at New York Bridal Fashion Week, Martha Stewart's Wedding Party, and other industry events for the first time in October 2014. • Became Virginia's #1 wedding blog on Google in early 2015. • Co-created and co-founded Aisle Society in July 2015. • Reached 10K fans on Instagram in early 2016. • Launched our Travels section in April 2016. • Co-produced and partnered Love It Up, a wedding experience with Town Center of Virginia Beach in August 2017. Professionally, it's been an incredible journey. Personally, it hasn't been an easy one. Since running a successful online publication is a 40+ hours a week kind of job, when life and health complications were tossed my way, it was a constant tug-of-war of body over mind and having to say "not now" a lot. (For those who live with chronic depression, you'll know exactly what I mean.) And when your job is all run by the mind, well, it's an adventure to say the least. I had to bring our amazing Tidewater and Tulle Crew on board a lot earlier than expected in the grand scheme of things (which was the best decision ever), so if it weren't for them, this ship would have been struggling just to stay upright. It was a big lesson in knowing your limits and giving yourself grace even when all the ideas are swirling in your head 24/7/365. Returning to the repeated requests, one of those swirling ideas was to design and create a magazine -- and 2018 was finally the right time to grow it. Now our hearts have always been for digital and immediate accessibility from anywhere in the world, and that's been our response from day one. But as I reviewed a few goals and hopes for Tidewater and Tulle in the long-term, the idea of a digital magazine kept popping up. So in mid-2017, research and planning went into how we can offer a digital magazine that would marry the two interests: everyday online content and more curated quarterly content available both in digital and print-on-demand. Without further ado... we are incredibly excited to announce a new addition to the Tidewater and Tulle media lineup: The Tidewater and Tulle Journal. Great news! Nothing is changing with the website; we will still be publishing daily content to our Weddings section and weekly content to our Travels section to inspire you! However, in addition, we also will now release a gorgeous digital magazine available for purchase, quarterly. It will contain the same diverse content as the website you've come to know, but will highlight the very best of the best from Hampton Roads, Richmond, and Outer Banks areas along with informative articles, fun columns, travel features, and more. When describing it to others, the heart behind the magazine has been all about joyful moments, diversity in love, and life-filled captures. We are designing this new publication with a story-anchored fine art aesthetic and with clean, modern layouts in mind. 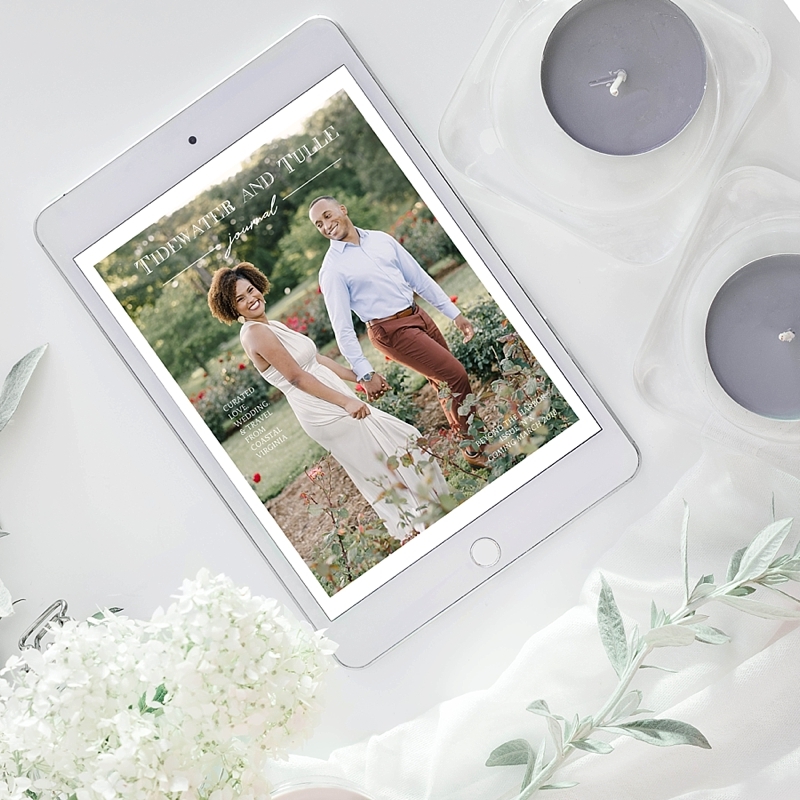 Each digital magazine will be a gorgeous keepsake, valuable read, and in the best coffee table quality, so if readers wish to choose to purchase the print version of any issue, it'll be something they will love to display and show off to friends and family. Some fun articles you can expect: Small Budget/Big Budget steals, Favorite Gift Finds for Under $75 (featuring local vendor recommendations), Signature Cocktail Recipes, and more for Beauty, Travel, Fashion, and of course, weddings. Our first issue will be out this March 2018 (with consecutive issues releasing June, September, and January 2019). The digital version will cost $4.95 and print-on-demand will be $24.95. Keep an eye out on our social media and website for the official release announcement in February! We are looking for the crème de la crème of Virginia and Outer Banks weddings and beautiful global destinations, but with our same mission in mind: diversity in love, weddings, and travel. Simple or luxe, we want to see it all and show off the beauty that can be found in all shapes, colors, budgets, sizes, and everything in between. To give you an idea what we will be publishing, these two previous T&T features have the perfect aesthetic for what would go in the upcoming digital magazine: for a January issue, this elegant winter wedding and for a June issue, this vintage military wedding. Print submissions will be exclusive to the digital magazine, and submissions can be made directly on this special Submissions form. For more information, please head to our Submissions page. For our premier March 2018 Spring issue, the deadline to submit is February 15, 2018. All magazine submissions will receive a personal response by February 23, 2018 whether or not they will be featured. Because of our goal for high quality content in a limited space digital environment, we will not be offering traditional advertising for the magazine. Unique, organic advertising opportunities for the digital magazine are only given exclusively to our current vendor fam. If you're interested in joining our vendor fam, we'd love to hear from you! Please head to our Advertise page for more details. I cannot begin to thank everyone in the best of words possible to describe how appreciative I am. Thank you for being part of this wonderful journey, for helping us be the best online resource out there for Coastal Virginia couples, for your financial support for this small biz, for your encouragement in the loud and quiet moments, and most of all, for the love you've shared with me, the Crew, and the couples and pros we have featured since 2013. On our cover mockup for this announcement, the photograph was taken by Sarah Street Photography from this beautiful Norfolk engagement session. We can't wait to reveal the official cover for our premier issue soon!